After two years at No. 1, Eindhoven got bumped down to No. 2 on our 2019 list of the best cities for expats for one reason and one reason only … housing. There’s simply more demand than supply as highly skilled internationals move into hot expat communities such as Meerhoven. As we’ve written many times, when we first came to Eindhoven in 2015, this was the bargain basement of Europe. There were lots of apartments and affordable rental houses because no one was buying. Eindhoven was still recovering from the collapse of housing demand from the Great Recession. How things have changed. Nationwide, the Netherlands has a housing shortage, and the average home price is projected to exceed 300,000 euros as early as next year, the highest sales price in history. With the influx of jobs from Brexit, home prices in Amsterdam are projected to increase 20 percent during 2019. Sources at various companies here tell Dispatches staffers apartments and homes rent or sell as quickly as they’re built. With all the construction cranes on the horizon, it’s clear that a lot of inventory will be coming on the market starting this summer and extending into 2022 at least. That is, if a lot of the announced projects actually get funding. We literally drove around the city, and what we found is far more construction than we can summarize in one post. • Strijp R – Unlike many projects on the list, Strijp R by Amsterdam-based developer Amvest has units completed or nearing completion. Like almost every building site, this was a former Philips facility. Where there were warehouses, Strijp R has blocks and blocks of homes. In the first phases, there are plans to build 250 units on the way to a total of 500. This is a great location, just northeast of the centrum and maybe a kilometer – five minutes by bike – from Strijp-S, which is the hottest residential and retail area at the moment. The homes are large and well-made. This is sort of the Dutch version of patio homes and a gated community so beloved by Americans. Of course, you’ll pay for this top-flight construction and proximity to the city. Prices start at 479,500 euros for about 175 m2 (1,800 square feet) of space and you can see units for sale here on Funda. • Strijp-S is one hot, hot district, with repurposed Philips warehouses and factories as well as a lot of new construction. And, as the developers will remind you, Strip S is the destination for Eindhoven’s Creative Class. Blok 59 is coming online as we speak, the tallest building so far here, though Stam De Koning is planning to build the Hassje Over tower in Strijp-S, which is planned at 19 stories. At Blok 59, it looks like apartments are renting for 1,600 euros per month for about 120 m2, or about 1,400 square feet. You can get more info here. Planned projects include Toren (tower) Frits, a new apartment development with 87 units, named after Frits Philips, the man who turned a lightbulb factory into a global electronics giant. Apartments in this still-to-be built tower start at about 300,000 euros for about 70 m2 and go up to 1 million euros for 220 m2. There’s just one tiny problem … they appear to be all sold. There are three more buildings planned, with construction starting on the property on the south end of Philitelaan at Glasslaan. There’s a great VR illustration here that shows you where everything is, and lets you “look” inside units. And we’ll have more details in Part 2 of the housing EBB. • Just a few blocks south of Blok 59, Sixty5 is scheduled to come online next year with 105 units. You can buy units that don’t actually exist because developers always try to pre-sell or rent units to cash-flow projects on the way to unloading them to institutional investors, collecting their profit. Right now it’s a construction site. • The Onyx apartment tower is yet another dramatic high-rise transforming Eindhoven’s skyline. The Onyx is topping out on the edge of the centrum, rising in front of the Victoriapark student and expat housing complex on Mathildelaan. The Onyx will have 135 apartments on 22 floors and a luxury penthouse on the 23rd story. Holland2Stay, which is a long-stay expat and student housing company that manages Victoriapark, appears to be the rental agent. You can get details here, but we don’t see any rental rates listed yet. This is the most visible (because it actually exists) of at least 20 new towers planned for Eindhoven during the next 10 years, including residential, office/commercial and mixed-use projects. Which is why we’ll have Part 2 of the special housing EBB next time. This is a city changing so quickly it will be unrecognizable even within the next five years. Stam de Koning is the major developer in this area. You can see all their Eindhoven projects here. 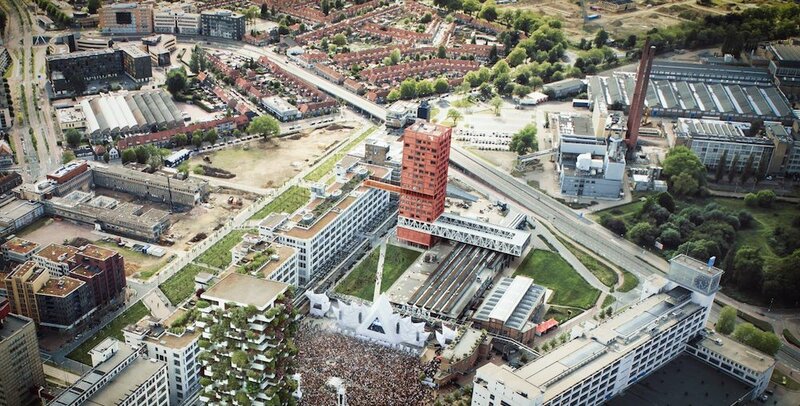 JSA based in Rotterdam is the major architect in Strijp-S.
• The Trudo Toren construction has just started in Strijp-S. Which we never really thought would get built. The plan is for 125 social housing units, subsidized by the government. This will be the first affordable housing project that’s a vertical forest, a concept imported from Italy. The vertical forest is meant to be a green environment for people and an environmental asset for the city with its pollution-neutralizing plants. The acclaimed Italian firm Stefano Boeri Architects has proposed these for several cities in the Netherlands, including Eindhoven and Utrecht and actually built two in Italy, according to The Verge. • Parc Fontaine is scheduled to be completed later this year with units starting at 1,700 euros per month for 82 m2, or about 1,000 square feet. This project started back in 2011, which gives you some idea of how long it takes to build residential real estate projects here. This is just a quick and dirty list. Through 2024, 27,000 homes are planned in the region around Eindhoven region, including at least 15,000 in the city itself, according to media reports. City officials are also considering 1,000 temporary housing units including at least one experiment with 3D-printed housing. More as we know more. But if the housing supply starts to match demand, look for Eindhoven to be No. 1 on our list again, because this is still the best place for highly skilled internationals to build careers. Three HighTechXL startups were in Paris last week, bring the deepest deep tech to Hello Tomorrow’s Global Summit 2019. Hello Tomorrow is a global non-profit effort to “unlock the potential of deep technologies to solve the world’s toughest challenges” by matching promising startups to the people who can fund them and/or mentor them. Which was exactly where his startup needs to play, said Rudie Verweij, incooling CEO. incooling is one of three startups at HighTechXL, the Netherlands’ preeminent high-tech and deep-tech accelerator, working on taking CERN and other advanced technology to market. incooling is adapting CERN’s CO2 cooling technology to cool computer chips, CPUs and graphics processing units. Six months in, incooling is still refining its MVP, so the team is beyond the “good idea” point, but not yet looking for an A Round. That’s good, Rudie added, because it means the relationships it started at Hello Tomorrow will be longer-term. The incooling team met representatives from several companies and investment firms interested in knowing how the CERN tech fits with real companies, with 10 interested in following up. Beside incooling, Aircision and Dynaxion also went to Hello Tomorrow from HighTechXL. Aircision CEO Luis Oliveira also pitched during Investors Day at Hello Tomorrow. Aircision (formerly Microspot) uses CERN’s structured laser beam technology to cover a greater distance and supply eight times more bandwidth than the best existing point-to-point telecom technology, he said. Dynaxion is developing a scanner utilizing the extremely short wavelength – 10 to the 14th nanometer – of the CERN fast proton beam accelerator. The goal is to have greater resolution than X-ray for devices that detect illicit and/or illegal substances. If Rudie’s trip to Paris as the CEO of a startup sounds better than Nine-to-Fiving it the rest of your life, there are still places available on the next group of startups, which – like incooling – will be working with deep tech from CERN, Nikhef and TNO. To find those ambitious people, HighTechXL is having its FasTrackathon on 27 March. So, yes, deep tech is at the center of all this. But we want to make clear that in addition to engineers and physicists, FasTrackathon also needs entrepreneurs, management talents and other “soft” skills. Because without them, there is no balance to go to market. You can see all the details about the tech here. You can register for FasTrackathon here. And of course, it’s free to attend. In a major shift of the center of business here, ASML is consolidating its 16,000-person Eindhoven workforce to its main campus and a nearby logistics center that’s under construction. That means ASML is leaving Flight Forum at Eindhoven Airport and High Tech Campus as early as 2021, according to Studio040.